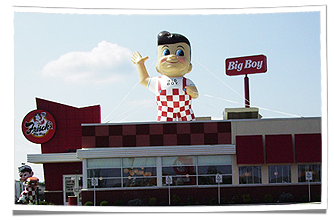 For over 10 years, Frisch's Big Boy restaurants have succeeded with using their inflatable mascot. Dressed in his famous red and white checkered coveralls, this American icon waves to oncoming vehicles as they approach the location. Big Boy is a familiar sight, but not one always associated with rooftop advertising balloons. But when drivers see his smiling face and curly locks sitting high atop the restaurant, they immediately get a hankering for double-decker hamburgers, freshly made onion rings and classic hot fudge cake. After 10 years, Richard Conrad, Marketing Manager, would know whether an inflatable mascot rooftop balloon works or not. "We use the Big Boy inflatable [mascot] for grand openings, and stores that have special events occurring in close proximity to their location such as state fairs, Tennis Master tournaments and Fourth of July fireworks festivals. We hope to draw attention to new stores, continue to raise awareness of our Big Boy character and increase business. We have used [rooftop advertising] balloons for over 10 years and have consistently seen increases in store traffic at display locations." Why Landmark? Because we overpromise and overdeliver. "Landmark Creations seemed to promise a level of customer service that I did not see in other balloon manufacturers - and delivered on that expectation. I will return as a future customer." 'Nuf said! Looking for more creative restaurant marketing ideas? Visit our online galleries!